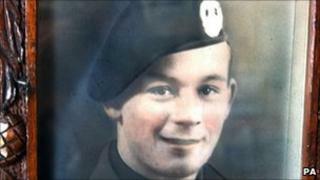 A Scottish bagpiper who played men into battle during World War II has died in Devon. Bill Millin, who was 88, played his comrades ashore on Sword Beach during the D-Day Normandy landings. The Glaswegian commando's actions were later immortalised in the film, "The Longest Day". Mr Millin, who lived at a nursing home in Dawlish since suffering a major stroke seven years ago, died in Torbay Hospital. A statement released by his family said: "This morning following a short illness piper Bill Millin, a great Scottish hero, passed peacefully away in Torbay hospital." Mr Millin was serving with 1st Commando Brigade when he landed in France on 6 June, 1944. His commanding officer, Lord Lovat, asked him to ignore instructions banning the playing of bagpipes in battle and requested he play to rally his comrades. Despite being unarmed, Mr Millin marched up and down the shore at Sword Beach in his kilt piping "Highland Laddie". He continued to play as his friends fell around him and later moved inland to pipe the troops to Pegasus Bridge. His bagpipes, which were silenced four days later by a piece of shrapnel, were handed over to the National War Museum of Scotland in 2001, along with his kilt, commando beret and knife. In 2006 when a song was written in his honour by Devon folk singer Sheelagh Allen, Mr Millin told BBC: "I enjoyed playing the pipes, but I didn't notice I was being shot at. "When you're young you do things you wouldn't dream of doing when you're older." For the past 66 years, Mr Millin returned to France on numerous occasions to pay his respects to his fallen comrades. His family said he would always be remembered as an iconic part of all those who gave so much to free Europe from tyranny. Mr Millin's funeral will be held privately, but a service of remembrance will be held at a later date.